Microsoft Exchange . Connects directly to Exchange Server, Exchange Online, or both; best for users who are connected to the organization’s network. Users will have full access to Exchange. If users plan to connect to Exchange using Outlook Anywhere, this is the option to choose as well. With Exchange, users can check mail on an email server and access any private or public folders to which they have been granted permissions. If you define a personal folder and specify that new email messages should be delivered to it, messages can be delivered to a personal folder on a user’s computer. POP3 . Connects to Exchange 2013 or another POP3 email server through the Internet; best for users who are connecting from a remote location, such as a home or a remote office, using dial-up or broadband Internet access. With POP3, users can check mail on an email server and download it to their inboxes. Users can’t, however, synchronize mailbox folders or access private or public folders on the server. By using advanced configuration settings, the user can elect to download the mail and leave it on the server for future use. By leaving the mail on the server, the user can check mail in Outlook Web App or on a home computer and then still download it to an office computer later. IMAP4 . Connects to Exchange 2013 or another IMAP4 email server through the Internet; best for users who are connecting from a remote location, such as a home or a remote office, using dial-up or broadband Internet access. It’s also well suited for users who have a single computer, such as a laptop, that they use to check mail both at the office and away from it. With IMAP4, users can check mail on an email server and synchronize mailbox folders. Users can also download only message headers and then access each message individually to download it. Unlike POP3, IMAP4 has no option to leave mail on the server. IMAP4 also lets users access public and private folders on an Exchange server. ActiveSync . Connects to an Exchange ActiveSync compatible service, such as Outlook.com, through the Internet; best as an additional email configuration option. Users can have an external email account with a web-based email service that they can check in addition to corporate email. Additional server types . Connects to a third-party mail server or other services, such as Outlook Mobile Text Messaging. If your organization has multiple types of mail servers, including Exchange Server, you’ll probably want to configure a connection to Exchange Server first and then add more email account configurations later. To begin, log on to the computer as the user whose email you are configuring or have the user log on. If the computer is part of a domain, log on using the user’s domain account. If you are configuring email for use with a direct Exchange 2013 or Exchange Online connection rather than a POP3, IMAP4, or ActiveSync connection, ensure that the user’s mailbox has been created. If the user’s mailbox has not been created, auto-setup will fail, as will the rest of the account configuration. The first time you start Outlook, the application runs the Welcome Wizard. You can use the Welcome Wizard to configure email for Exchange, POP3, IMAP4, and ActiveSync mail servers, as discussed in the sections that follow. Start Outlook and tap or click Next on the Welcome page. The procedure is nearly identical whether you are working with Outlook 2007, Outlook 2010, or Outlook 2013. When prompted to indicate whether you would like to configure an email account, verify that Yes is selected, and then tap or click Next. For computers that are part of a domain and for users that have an existing Exchange Server mailbox, the wizard uses the Autodiscover feature to automatically discover the required account information. For computers that are part of a domain and for users without an on-premises Exchange mailbox, leave the wizard open, create the user’s Exchange mailbox, and then proceed with the wizard once the mailbox is automatically discovered. 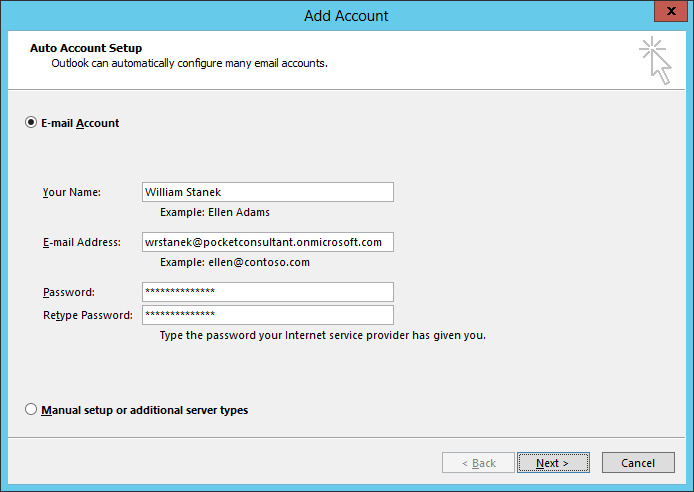 For all other configurations, including computers that are part of a workgroup and computers on which you are logged on locally, Outlook assumes you want to configure an Internet email account for the user. Enter the user’s account name, email address, and password. Then type and confirm the user’s password (see Figure 1). Figure 1. Although the wizard can automatically fill in account information when you are logged on to a domain, the wizard does not do this for other configurations. After you tap or click Next, the wizard uses the new Auto Account Setup feature to automatically discover the rest of the information needed to configure the account and then uses the settings to log on to the server. If the auto-configuration and server logon are successful, tap or click Finish and skip the remaining steps in this procedure. The wizard then sets up the user’s Exchange mailbox on the computer as appropriate. If auto-configuration is not successful, tap or click Next so that the wizard can attempt to establish an unencrypted connection to the server. If the auto-configuration and server logon are successful this time, tap or click Finish, and then skip the remaining steps in this procedure. If auto-configuration fails twice, you’ll see a prompt to confirm the user’s email address. If the email address is incorrect, correct it, and then tap or click Retry. If the auto-configuration and server logon are successful this time, tap or click Finish, and then skip the remaining steps in this procedure. If all attempts at auto-configuration fail, you can try to configure settings manually (and might also want to confirm that the Autodiscover service is working properly). Tap or click Next. On the Choose Service page, select a service. Tap or click Next. On the next wizard page, complete the necessary information for the type of email service you selected. If necessary, tap or click More Settings, and then use the Properties dialog box to configure the additional required settings. When you are finished, tap or click OK to close the Properties dialog box. Tap or click Next, and then tap or click Finish to complete the mail configuration.